I started playing music when I was about 8 or 9. I started out with minor percussion like bongos, shakers and djembes. I have known both Steve Ulrich and Carlos Cush pretty much since I started music. Cush was one of the people that guided me and suggested me and my parents to take music lessons. Since then I took music lessons with different professors in Panajachel, including at the Atitlan Music School. 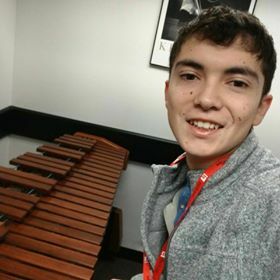 A couple years after I started percussion, I fell in love with the marimba. Since then I have been playing marimba. About five years ago or so, I started to think about what I wanted to do as a musician and if I wanted to pursue a career in the music field. That’s when I heard about Berklee and decided to pursue that as a dream. And little by little I started studying more music. I then started going to the Guatemalan Conservatory. Meanwhile in Pana I was playing at some places with my group, which played contemporary music with marimba and other instruments, and traditional marimba music. At one of those gigs, Steve and I started talking and he offered me to work at the school, teaching. As he said he had wanted for a while for me to be involved at the school. So, I started going to a uke club that he started, since then I was playing ukulele. Then when the group instructor left, Steve put me in charge of that group and also as a uke teacher. I taught for a while, a few months or so, at the school. When I started my applications for universities, including Berklee, I came to Cush for help on drum set and other percussive instruments. It had been a while since we had gotten together to do music. And so, for about six months I took classes with Cush until I left for Berklee. I feel the school helped in both ways, being an instructor and student. That is a nice thing about it, you are always learning. There were times when I felt both Cush and I ended up learning from each other in a lesson. The duality of the school makes it dynamic and a great environment to learn, because you are constantly learning. Cush and the school gave me the space and opportunity to express myself and learn. Which have helped me up to date, being at Berklee.